We spend on average $65,000 a month, or per year: $780,000. Since 2007, we’ve spent 2.6 million USD. Our salaries are considered very good and workers often work week-ends, holidays, and long hours in the forest. 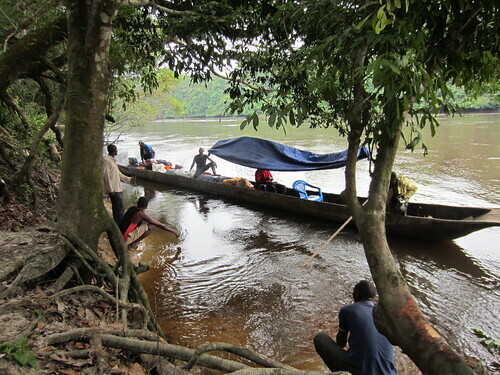 The Lomami National Park, a park in the making, needs all of them. Approximately 600 man-days per month of daily labor including porters, scouts, trail cooks, and bicycle transporters. Some of these have been with us for years. Contract workers vary from $300 a month to $ 1300 a month. Director and Scientific director have the top salaries at $5000 a month. Monthly workers vary from $150 a month to $ 300 a month. Daily-wage workers get from $3.5 a day to $ 10 a day depending on the job. 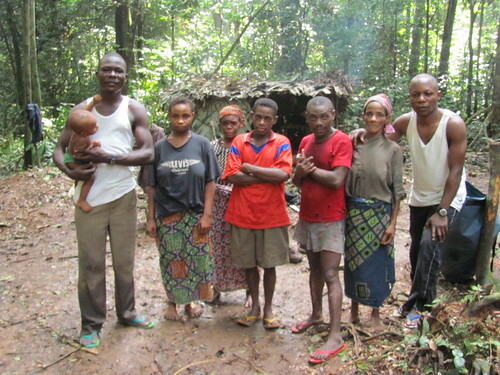 Henri, one of our team leaders, in a pygmy camp near Obenge. How do these compare with other Congolese salaries? A contract-wage laborer at the factory next to us in Kinshasa earns $120/m. 25 horsepower outboard motors go for $4000 in Kisangani. Bicycles that actually move more of our equipment than motorbikes. These Chinese-made clunkers are rebuilt soon after purchase -$120. Helmsman, Papa Bolenga, turns our smallest of 3 dugouts around. Communication – by thuraya, by internet, by mobile phone…altogether about $2000/mo or $24,000/yr. And there is always a special project: radio show, village outreach, a special provincial meeting to discuss hunting. 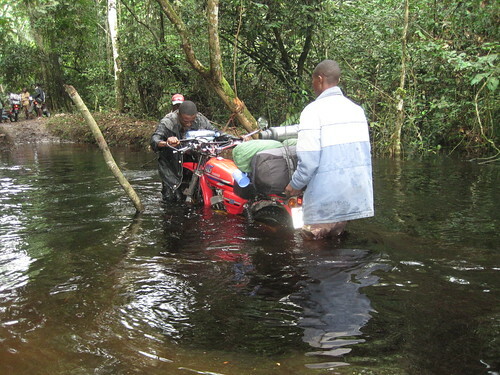 Gillain, our driver in Maniema, is balancing a new motorbike across a single-log bridge after a heavy rain.